Next post in the series! It must have been ~1990 when i got the used Fiat Ritmo III 70 from my parents. I added fog-lights, a better audio-system + remodeled the ashtray for storing audio casettes(!) and even added a tricolore-sticker at the back - the only time i got into (at least: exterior) car tuning :-). ~1992, after some years at my first job i got a Fiat Tipo 1.9 TD. Probably the most expensive car (related to income) i ever bought. The digital dashboard was definitely ahead of its time, even if Fiat was critizised for it's "Mäusekino". All in all the Tipo was a really great car from various points of view. ~ 1999 i upgraded (?) to a Fiat Brava JTD 105. The logical successor, looking back i see no other pro's. I liked it at its time, but from a distance it looks ... unreasonable. Next deal was some kind of "rightsizing": ~2004 a Fiat Punto Classic 75 replaced the Brava. Three years later we needed a family car and got a Renault Scenic Cdi 1.7. I sometimes moan about the regular service beeing too expensive, but beside that it's a pretty reliable & comfortable car. I plan to drive it as long as possible (cross my fingers). Over the last years i repeatedly got the idea of posting some personal historical stuff. A short history of ...my PDAs and mobiles. It must have been ~1995 when i first stumbled upon PDAs. After handcrafting calenders & organizers for years i was fascinated by the idea of getting digital and some Apple Newton ads nearly conviced me buying one. While i was already scanning eBay for used items i got involved into networking stuff at work and bought a US robotics modem for personal use. Packed with this 56k powerhorse :-) there was some advertising material for a Palm Pilot and i immediately was convinced and got one. The Palm was an amazing device, it allowed (simplified) handwriten input with great detection capabilities, sync to PC, offline and later online Web browsing, RSS newsreader, IR and later Wifi&Bluetooth data transfer and a lot more. Various Devices served me really well as "productivity machines" until 200x. The mother of all PDAs. 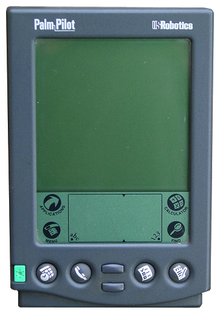 The Treo680 was my productivity machine during building our house. I even changed the screen twice after it got broken in accidents. And finally: beside the Siemens Phones i still own all of the devices!